The sum of money added to the cost of products to cover overhead and profit is pricing markup. If you want to have profit, you should include a reasonable markup in the prices of your products. Dropshipping profit mostly depends on what kind of products you are selling. This is why DropshipMe database includes products from different niches with a high margin potential. Such products mostly cost within a $1-$20 price range and generally can be priced at $20-$50 or more. The most successful dropshipping stores have proved that such profit margin range is optimal. To make your business profitable, we recommend having a profit margin of 40%-70%. DropshipMe plugin can be used on sites with WooCommerce only or with AliDropship plugin installed. Depending on this, there are different pricing options. 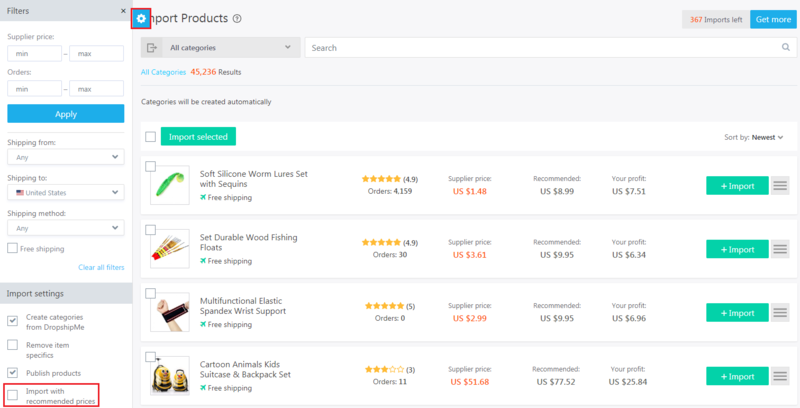 If you disable the option ‘Import with recommended prices’, all products imported to your store from DropshipMe database will appear with their original prices. You can edit prices for each product manually in Products section. Note that if the product has variations, each variation should be edited separately. If you want to have your products imported with already added margin, enable the option ‘Import with recommended prices’. Using this option, you will not have to edit all prices manually. So, you can take benefit of recommended pricing markup and save a lot of time and efforts. AliDropship plugin features a profound system for pricing markup – the amount added to the cost of goods to cover overhead and profit. So, if there is AliDropship plugin installed in your store, the pricing depends on the profit margin formula in settings. Note that if you select an option 'Import with recommended prices', your pricing formula stops working. In this case the products will be imported with the prices recommended by DropshipMe.